There is one mechanically efficient way of walking: vault over a stiff leg, shove off, then crash into the next vault. Humans achieve this, even when walking in high heels or on tiptoes. 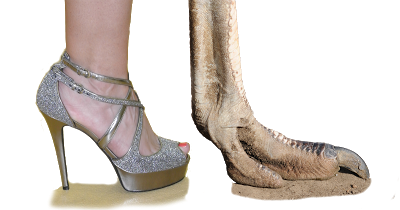 Ostriches do too, even though they completely lack a functional ‘heel’. The normal human foot and heel-sole-toe stance, though, has the advantage that it allows those muscles powering the shove (calf) and absorbing the crash (shin) to be largely unloaded during the vault. 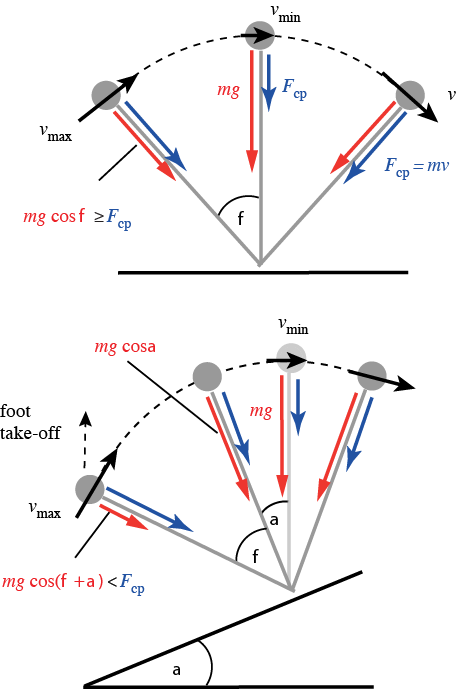 This is a benefit as muscles use energy when opposing force. But motors don’t – so prosthetics and robotics should not copy human feet. Usherwood, J.R., Channon, A.J., Myatt, J.P., Rankin, J.W. and Hubel, T.Y. (2012). The human foot and heel – sole – toe walking strategy: a mechanism enabling an inverted pendular gait with low isometric muscle force? J. R. Soc. Interface. doi: 10/1098/rsif.2012.0179. Many aspects of walking can be understood from exceedingly simple models – for instance, considering what would happen with a blob on a stick representing the mass vaulting over the leg, and another blob on a stick representing the leg swinging under the hips. Such models give a surprisingly good account for why we can’t walk any faster (which is quite different from why we don’t want to run any slower), and why we can’t take a walking step longer than 1.5 times your leg length, even if you can do the splits (you end up dragging your feet). 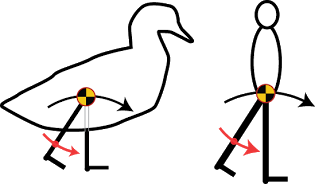 When the walking mechanics of a range of animals including humans, ducks, pheasants and guinea fowl, are compared with these models, it becomes apparent that humans are unusual: we drive our legs forwards relatively quickly, allowing us to take relatively short steps… which, according to the blob-on-stick models means we should be able to walk relatively fast. Which is true. The super-simple vaulting model of walking can be used to make predictions. One case where it works is in predicting the change in walk-run transition speed when going up hill. Just as for level walking, we may ‘want’ to walk faster, but can’t because gravity stops being able to keep our feet on the ground. This work was led by Tatjana Hubel.